Robotics process automation, or RPA, is becoming big. And this month, RPA is our main theme. Information Age talks to three of the top players: Blue Prism, UiPath and Automation Anywhere. So here we begin RPA month by comparing and contrasting. Is there a danger that some companies are implementing RPA, without fully understanding what it can offer, as a result they may be left disappointed? Many enterprises that have used Robotic Process Automation (RPA) have seen the power of digital transformation, even if only in a small way through a few automated processes. The transformational value they experience is often a tipping point that whets their appetite for even more automation and deeper levels of application integration. But, this creates a quandary about how to maintain the array of automations. Ultimately, their success depends on the scope of the centers of excellence (COEs) that maintain their automations. Let’s explore further. I believe that RPA has helped companies that previously held back from adopting newer technology solutions see the value of a digital mindset. These converts are now finding more opportunities for automation, and greater conviction in moving to digital-first operating models. In short, something comparatively simple like RPA helps inspire confidence and vision. Once this passion is unleashed, organizations come to fully appreciate that RPA is only one tool for automating operations. Many desire to transform their high volume, fast processes, and must confront the reality that surface-level RPA integrations are often not sufficient. The next steps towards more powerful automations often include integration via connectors and APIs. The following exhibit reflects the diversity of systems which may now need to be integrated in a digital-first operating model world. (Spoiler alert: we’ll be writing a lot more about the Digital Capability Platform in the upcoming months.) And there are many ways to go about creating the needed integrations. Some enterprises have cast aside the promise of surface-level RPAs, and now use their RPAs more through APIs. This is a bit ironic and worthy of a discussion by itself, but let’s get back to what happens as the types of automations proliferate. One thing that all integrations – surface, APIs, or connectors – have in common is that they need maintenance. With surface-level RPA, you need to do a lot of robot maintenance when application layouts change. But all integrations, RPA included, require maintenance for other reasons as well. The biggest is the need to resolve data ambiguities, e.g., common customer names (think Jane Smith) with similar account types requesting a temporary address change. Which record should be updated? How can this correctly propagate across all the relevant systems and processes? I can hear some of you saying that the COE should be an overall digital center of excellence. My answer is a big “no.” Digital is a far broader field that often involves major legacy transformation projects. Automation is clearly a part of digital, but it is operationally focused on the practical realities that come from modernizing processes that still primarily run on legacy systems. This is a different mindset and a different set of competencies. As a result, it is best to keep a separate automation COE focused on the details of operational processes, while separately working towards the corporate digital objectives in a broader digital office. And that automation COE’s remit should be bigger than just RPA – it must deal with the combination of all types of automations that are enabling the operating processes. The relationship between RPA vendors and their clients isn’t so different from the relationship between Marvel Studios and its fans. Since the movie Iron Man hit the big screen in 2008, fans’ expectations of superhero films have skyrocketed. Despite the rising and evolving expectations, Marvel has satisfied its audience and has made a little pocket change in the process. In a similar way, RPA buyers are expecting increasingly more from their RPA vendors. So, have RPA technology vendors been MARVELous in their customers’ eyes? Our recent research study among 50 enterprise RPA buyers makes it clear that vendors have excelled in addressing their primary drivers, which are cost reduction and process optimization. However, vendors didn’t score as high on secondary drivers such as improved customer experience, governance, and top-line growth. With increasing awareness about the potential impact of RPA beyond immediate cost and efficiency benefits, enterprises have started to view RPA as a primary contributor to their digital strategy, rather than a tactical measure. Consequently, technology vendors should focus on continuously evolving their RPA solutions with a host of capabilities to help enterprise buyers achieve their strategic business outcomes. As to be expected, the buyers in our research study found their RPA vendors excelled in certain areas and had work to do in others. As there are so many RPA tools available in the market, each with its own strengths and weaknesses, it can be daunting for enterprises to select the right vendor for their unique needs. One critical part of the decision-making process is to focus on the X factors that are most important to their strategic agendas. Our study found that factors including “ease of use and robot maintenance” and “scalability” highly correlate to buyers’ overall satisfaction levels. This is not surprising, as these are factors that buyers typically face issues with during RPA adoption. “Product vision and strategy” – and in some cases vendor expertise in a specific vertical industry or function – are also important buyer X factors. While it’s clear that RPA vendors can do more to satisfy the needs of their customers – and that they’ll need to continually evolve their solutions – they have indeed been relatively MARVELous in delivering value and overall satisfaction to their buyers. The news of another big round of funding for UiPath, US$225 million series C, and a valuation of US$3 billion created a lot of excitement and amazement in the market. It followed on from Automation Anywhere’s whopping series A funding round of US$250 million in July, which valued the company at US$1.8 billion, and which surpassed UiPath’s earlier series B funding of US$153 million and a valuation of US$1 billion in Q1 2018. These valuations are phenomenal. In UiPath’s case, the rise from US$1 billion to US$3 billion in less than six months is, I believe, unprecedented. You might think that investors are living on a different planet than us ordinary folks, and that this kind of valuation is plain wrong. I beg to differ. My case rests on the rapid increase in market adoption and the huge investments that vendors are making in their platforms. As much has already been said about the fast rate of enterprise adoption, there’s no need for me to repeat it again here. Jumping to the second part of my case: RPA today is not the RPA that launched this market three to four years ago. The original developments lacked many of the features that we see today, e.g., computer vision to pick objects on the screen and robust control panels. Similarly, tomorrow’s RPA will be superior to today’s. As someone who assesses RPA technology on an annual basis, I see a fast rate of product development, not just year on year, but in some cases quarter by quarter. 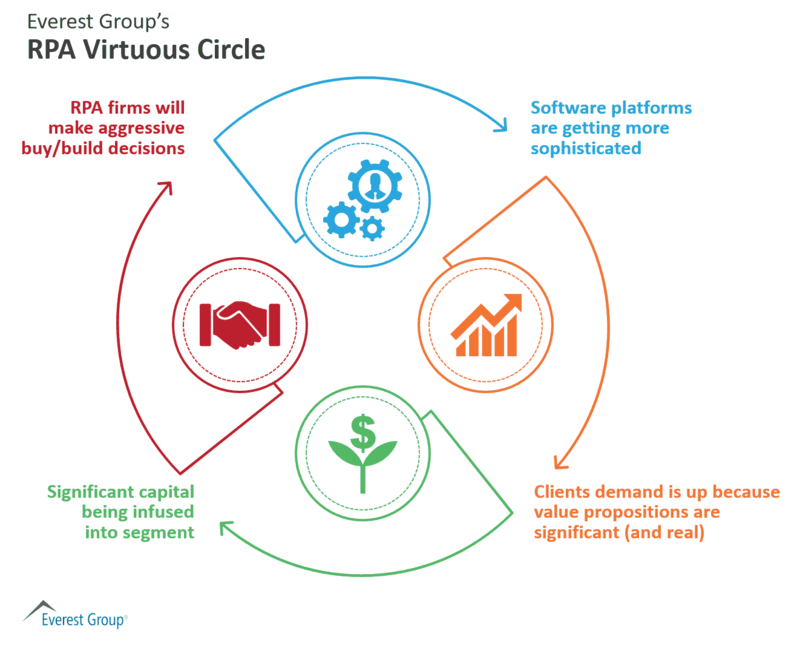 Everest Group’s “RPA Virtuous Circle” highlights the continuous cycle of developments in the market. Much has been said of organizations struggling to scale their deployments. I completely agree with this, and for a while I’ve been asking vendors to do something about this issue. I am delighted to see that they have been listening and are investing in features for scaling. These include enhanced robot run time control and management features including intelligent control systems for dynamic workload balancing, auto-scaling, and even identifying processes for further automation. Another major stream of development is turning RPA platforms into the glue that holds together business process management systems (BPMS), different varieties of machine learning, and narrow artificial intelligence. These will ultimately be integrated and will combine seamlessly to provide end-to-end process automation. While vendors do their bit for scale, organizations should also examine their deployment models for RPA and take a more programmatic approach. Automation is going to be a serious competitive differentiator, and a programmatic approach would significantly speed up organizations’ adoption and realization of desired outcomes. Everest Group’s RPA Pinnacle study highlights some of the approaches that organizations have taken to achieve excellence in RPA. Of course, these enormous investments in RPA do carry some risks. There is the possibility of tech giants bringing their own RPA solutions to market, in turn pushing out the current RPA vendors. But that wouldn’t be easy to do, as the existing vendors have gained a lot of hard to emulate know how in the past few years. And any one of the existing RPA vendors could be acquired in a major acquisition, but then the investors would get the handsome returns they anticipated…just in a different way. Another reason for my optimism about the recent investments in RPA and vendor valuations is that I recently got a glimpse into the future of business automation by looking at manufacturing. On a visit to Siemens Digital, I saw how the concept of digital twin and simulation of manufacturing processes is helping speed up production times and efficiency, even in manual/human processes. For years, corporate global services functions have attempted to copy manufacturing principles, e.g., adopting Lean and Six Sigma methodologies. Today, they have moved on to automation, which manufacturing adopted decades ago. Having started on automation of global services, enterprises are not going to turn back. They will continue to follow manufacturing’s lead. Leading organizations are already giving their processes version numbers with supporting documentation, having taken each step through a rigorous Lean Six Sigma methodology. On the automation front, while the focus has been primarily on tactical needs, it will increasingly move to outcomes and the finished “product,” as in manufacturing. We will see enterprises develop digital twins of their processes or robots, and run complex functions end-to-end in virtual reality before committing to the final model for deployment in the real world. Future versions of RPA will have to support these requirements, and that is where some of the millions of funding will be spent; on product development and advanced features. My recent meetings with the top RPA vendors made it clear that RPA is shifting into new gears of adoption and implementation. But the vendors also made it clear that the true promise of RPA is getting lost in flashy headlines and hype-ridden marketing messages. Here are my five recommendations for how enterprises can drown out the noise and harness RPA’s real benefits. The question “Should I pursue RPA?” has been answered and is widely being replaced with “How can I leverage RPA to gain the most value?” As you see in the graphic below, the benefits of RPA are very real. Nearly every enterprise we have spoken with is seeing real savings – typically around 30 percent lower cost and 30-50 percent improvement in accuracy, cycle time, staff productivity, etc. Despite all the hype, enterprises must remember that RPA vendors are not selling a digital workforce; they are selling software that can speed up, improve, and support many processes currently performed by staff members. While this is sophisticated software, it’s not a physical entity or an army of robots. It can be tempting to get lost in the imagery, but enterprises need to be careful not to lose sight of what they are getting. Otherwise, they can be left with the feeling that vendors have overpromised and underdelivered. From OCR to NLP to Intelligent Automation, there’s no shortage of RPA buzzwords. But the labels themselves don’t really matter. What does matter is the ability to identify processes that are using precious staff resources, limiting operational improvement, or diminishing the customer or employee experience. Enterprises should start with the process they want to improve and then approach the vendor with that specific need as the starting point in the context of their overall automation – including and beyond RPA – journey. The basics of building an enterprise automation capability can seem amazingly easily…until it becomes obvious that it’s not. Some enterprises undoubtedly acquire robots for simple plug-and-play automation. But when mission critical processes come into play, serious and complex issues – like enterprise-grade security and business continuity – come into play and must be carefully and thoughtfully addressed. Don’t allow these issues to become barriers to RPA adoption (as many enterprises do), because, if well implemented, the benefits far outweigh the risks. Automation tools can help enterprises tackle the labor shortage challenge by making their existing teams more productive and retaining key employees by offering opportunities to perform higher-value work. Although cost savings are important, an automation-augmented workforce is key to competing and excelling in the marketplace. Business problem complexity – how big and complex is the business process? Rate of operational improvement – how much of a business process improvement do we want to see? Solution/technology investment – which of the many different automation solutions should we deploy (considering investment and benefit)? Operational execution – how do we best implement in your organization? At the end of the day, however you choose to move forward with RPA technology, start by considering your enterprise’s use cases and business requirements. Then, build the business cases to support them. And then set your automation team loose on an increasingly exciting new set of capabilities.